Noah and the Rosa-Haas twins have been best friends forever. It got a little complicated when Alan told Noah that he was gay, and then Noah fell in love with Valeria, but now all that is behind them, and they all work to maintain what Alan calls “the delicate triangle.” It’s the summer before their senior year, and the three plan to go on to local colleges in Illinois so that they can stay close. Noah is conflicted. He may not even want to go to college. Lately, all he’s been doing is writing his summer assignment, “A Concise History of Me,” which is becoming less concise by the day, and obsessing over his Strange Fascinations. His fascinations include an abandoned photograph dropped by a local rock star, an old man in the neighborhood with a goiter, a novel by his favorite author, and an online video called the Fading Girl. In the video, a woman took a photo of herself in the same place every day for forty years. She fades. We fade. Since he would never do so on his own, Val convinces him to go to a party in a huge home, where he makes the mistake of tasting a cherry Hurricane and deciding that it is really quite nice, which leads to another and another. This is how he finds himself explaining to a lovely girl that yes, he wears the exact same pants and David Bowie t-shirt every day because it is much more efficient to do so— plus, Bowie. When she backs away, he exclaims that no, no, he has ten sets of the same pants and t-shirts, so he does wash them in between. When this does not convince her of his sanity, he wanders off and ends up in the library, where he meets Circuit Lovelock. Circuit and Noah have a deep and meaningful conversation in which they deplore the shallow and meaningless conversations one normally has at parties. In the end, Circuit convinces Noah that he needs a change in direction, which he can give him at his house. Despite his misgivings, and under the influence of cherry Hurricanes, Noah walks through the neighborhood with him, passing the old man with his collie, Abraham, on his front porch. At Circuit’s house, things get weird, and Noah gets up abruptly and leaves, passing the old man with his Labrador, Abraham. Wait…. Suddenly, the world has changed. Not a lot, but subtly. His mother has a scar on her cheek he doesn’t remember. Val and Alan are going out of state to college. His parents watch Seinfeld instead of Friends every night. What is going on? The only one who hasn’t changed is his little sister, Penny. She is still obsessed with Breakfast at Tiffany’s and walks around quoting Audrey Hepburn. While the reader is working hard to untangle the clues and help Noah back to his former life, Arnold treats us to continual streams of what he calls “the minutiae”: loads of delicious details, some true, some imagined, that create Noah’s world and consciousness. He weaves it all together so convincingly that he had me looking up Mila Henry, Noah’s favorite author, so that I could read some of her books. No go; she’s a fictitious character. As in every David Arnold title, it’s not just the plot that pulls the reader along. It’s the quirky but lovable characters and his distinctive writing style that make his novels such immersive and unforgettable experiences. The language is frequently foul in the style of an uncensored sixteen-year-old boy. Just as I swore that I would not read another young adult novel anytime soon, Penguin Random House sent out an email about this third novel by one of my favorite YA authors. I had to get my hands on it, and I was not disappointed. Noah’s library chat with Circuit was so delightful that I wish I could quote parts of it, but since I read an advance reader copy, that is verboten. So, I will paraphrase one part where Noah relates a conversation between Alan and another boy about a band. One loved it and one hated it. When Circuit asked Noah what he thought, he said that he thought it was just okay, which is apparently no longer acceptable. Not having a strong opinion about something is now “a lost art.” One must either love or hate everything, and he just doesn’t. Exactly. And that was the moment that I decided to have a strong opinion about this book. I loved it. Disclaimer: I read an advance reader copy of this book, which I begged from my book distributor. It will be published in May, 2018. Opinions expressed are solely my own and may not reflect those of my employer or anyone else. Imagine how difficult relationships would be if your face were a total blank. Your friends would never know if you were surprised, hurt, thrilled, or angry. True, you would make a great poker player, but most of life is not a game. Victor Benucci has Moebius Syndrome, a condition that causes facial paralysis, and although his emotions since his father’s death two years ago have been tumultuous, most people wouldn’t know it. Vic feels that his mother should understand, at least, and so he is cut to the heart when her new boyfriend announces their engagement. Vic runs out the door, grabbing the urn containing his father’s ashes, and without planning it, he falls in with the gang of misfits that he has always admired from afar. The object of his greatest admiration is the beautiful Madeline, devotee of The Outsiders, who has yellow hair that is long on one side and shaved on the other, revealing a scar she doesn’t discuss. The gang also includes little Coco, who struggles to control her foul mouth, and the selectively mute Nzuzi, whose brother Baz acts as a young adult guardian for the group. As the novel opens, a murder has been committed, and the story is told in depositions and flashbacks from Vic and Mad’s alternate viewpoints. Soon after being taken in by the gang, Vic finds a note in his father’s urn, poetically telling his mom how to dispose of his ashes. The whole gang takes part in figuring out the clues that name places that were significant in Vic’s parents’ love story, but are nearly indecipherable to anyone else. As the reader unravels the murder investigation, the road-trip mission of disposing of Vic’s father’s remains, and the back-stories and growing relationships of the unlikely group of teens, she will begin to see the tapestry of suffering, compassion, and love that wove them together. Interestingly, Baz is openly religious, which is rare in teen literature. The faith of Zuz and Baz, who endured terrible pain in their war-torn home country, adds a thoughtful layer to this already complex novel. In spite of all the complexity, however, this is a highly readable story with compelling characters and a core of pure love. Besides the foul language, this is a beautiful novel for all teens and adults. It will make you think. Highly recommended. I stood in line for a galley of this book in May (See my BEA geek-out story from May 23rd! ), but I held onto the review for a while, since it will not be available until September 20th. However, I can personally attest that you can put a hold on it at the library where we live now, and it is available to pre-order, as well. Disclaimer: I read a signed galley of this novel. Opinions expressed are solely my own and do not reflect those of my employer or anyone else. Mary Iris Malone liked her old psychiatrist better. This new one wants her to take medication, and her father is thrilled to have someone finally agree with him. He is determined to have everything go smoothly and normally now that he left Mim’s mom in Ohio and moved to Mississippi with Mim and his new wife, Kathy. Now Mim hasn’t heard from her mother in a while, and when she is called to the office at school, she overhears her stepmother telling the principal that Mim’s mother will beat this disease, that she’s a fighter. What disease? Mim turns around before they see her and walks right out of school, finds the coffee can where Kathy keeps her cash, and takes off on a Greyhound bus to see her mom while she’s still alive. Told in Mim’s inimitable voice and punctuated by letters to an unknown person named Isabel, this road trip story packs in a cast of colorful characters and wild situations. Equipped with a tricky epiglottis, Mim has to work to keep her lunch down, which can be a blessing or a curse, depending on whose shoes are in front of her. During the trip, she decides not to take her medication, so the reader is continually aware that everything Mim sees may be filtered through schizophrenia. Mim is precocious and well-read, with a vocabulary both prodigious and foul, a great storyteller who often ends a depressing tale with “…’twas ever thus.” Her journey is peppered with creepy old men, great old ladies, a homeless boy (“Hey, hey. I’m Walt.”), and a devastatingly handsome young guy, to name a few. All of these people work to help or hinder Mim’s desperate journey to reach her mother before it’s too late. When I read the description of this debut novel, I didn’t think it would interest me, but I bought it for the library because of all the starred reviews. I read it only because I knew it would be a Printz contender next year. By about page two, I fell in love with it. This is a brilliant novel, and Mim is one of the most appealing protagonists I’ve read in a long time. Her voice is sterling: so tough, and yet terribly vulnerable. Smart, witty teens are one reason that my job is so gratifying, and I resent it when people say that the teen characters in some YA novels are unrealistic. I know too many great kids to believe them. Teens have little control over their own lives, and Mim is someone who has fought against the choices adults have made in her life—either ignorant choices for her or self-centered choices for themselves—with her natural intelligence and humor. Sometimes, she is afraid to trust the right people because so many have let her down before, and yet her heart is wide open to the inner beauty of the innocence she sees in Walt, another character who is just… well, I have tears in my eyes just remembering him. 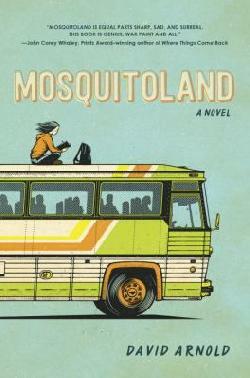 I highly recommend Mosquitoland, with the caveat that the language can be rough and the situations are sometimes those that should be expected of a sixteen-year-old girl traveling alone. Older teens and adults. Kudos to David Arnold on an incredible debut. May he write many, many more.